Looks like Facebook is as wary of Big Brother as the rest of us. Facebook is testing an experimental encryption feature as a safeguard against surveillance. You’ll be able to share a public encryption key in your profile, and set up encrypted notifications so that all the emails you receive from Facebook will be protected with encryption. 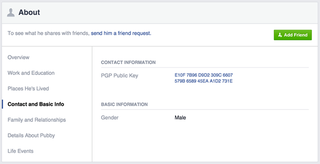 Facebook’s encryption work with OpenPGP, and it uses GNU Privacy Guard (GPG), a popular free implementation of PGP technology. If this all sounds confusing, Lifehacker has a great guide to setting up email encryption if you haven’t done so yet, and the first step is simply downloading GPG from its website. This’ll help you start sending encrypted emails, which means whatever you write will look like a garbled string of characters until you use a digital key (that you can set up through GPG) to unlock the message. Facebook is primarily a business that relentlessly monetizes the idea of human connection; Mark Zuckerberg grow rich on the value of users’ personal data. But as much as Facebook needs people to keep posting personal information, it also needs people to feel secure doing so. While encrypting email notifications isn’t nearly as cool as offering native chat encryption would be, it’s a start. Unfortunately, the feature doesn’t work on mobile yet, but this is a smart move. I hope it can inch the use of encryption into the mainstream.